Hard drive prices have recently become very affordable across many retailers. Many PATA and SATA drives can be had for 50 cents a gig or lower after rebates and other incentives. With the abundant availability of hard drives, it makes great sense to buy a bunch and hook them up as external storage drives. 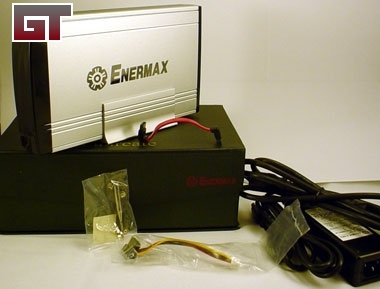 Today I received a new USB 3.5" HDD, the Laureate enclosure from Enermax. 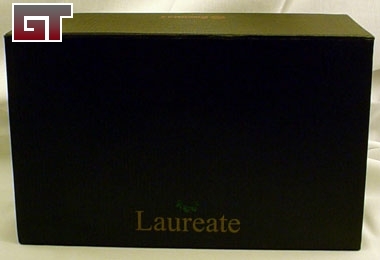 The packaging is not the standard cardboard box that you see on shelves. It leads me to believe that they are out to give the impression of high standards and that this may not be a run of the mill HDD enclosure. Let's put some of these hard drives to use! Let's take a look at what's inside this box and what it has to offer. Handles both standard PATA and SATA drives. Supports USB 2.0 for speed and easy Plug N Play. Easy open front panel w/ push tool. Aluminum stand and rubber feet if you choose not to use the stand. Both PATA and SATA power and data cables. The HDD enclosure is in a black plastic box which is formed around it and under that is another box that has all of the extra stuff. 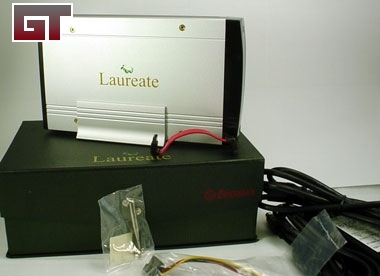 One of the first things I noticed about the Laureate is how thick its aluminum case is and how nicely the stand that it comes with matches it. Additionally, the stand has a clear rubber grip on the inside to hold the case and keep it looking good without scratching. One side of the case has the Enermax logo and name, the other side has Laureate, written in gold with a green laurel wreath above it.